Located in Roppongi, the central business and entertainment district of Tokyo, the front door rarely has the opportunity to completely close, especially around noon. Once inside, we found clientele mainly in suits, as older men slowly enjoy ramen solo at the front counters. Due to our pressing hunger, we ordered the largest and most expensive lunch special for 840 yen ($7.50). The set included plate of six gyoza (Chinese style dumpling), a bowl of fried rice and larger bowl of ramen. The ramen had a bold, flavorful taste with tender dual slices of pork and all the fixings (bamboo shoots, green onions, mushrooms and seaweed sheet). Adding a dash of rayu (red spicy oil) and black ground pepper enhance the full-bodied hot broth. 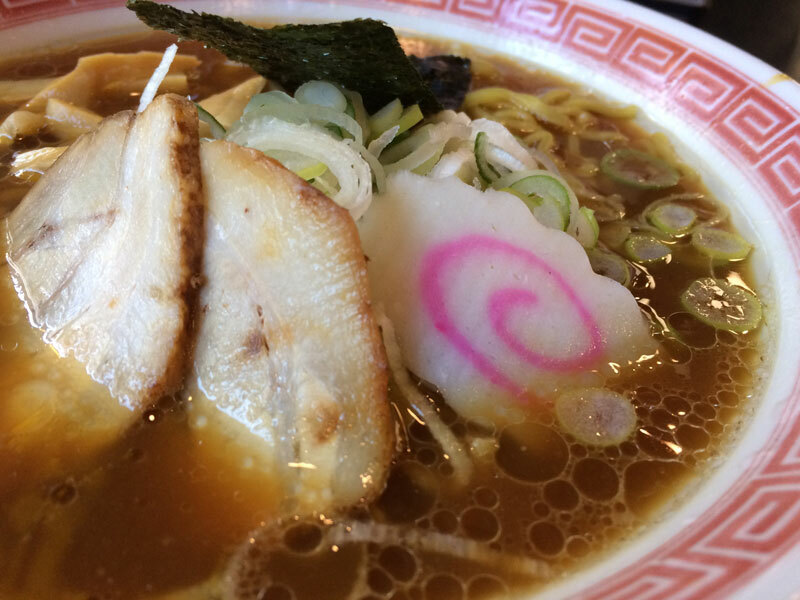 As it goes for all noodle dishes, do not wait too long to get started, as noodles of ramen will soak up broth and become soggy. As this was not the case, the noodles here were firm and fresh; slightly oily. You can drink up the tasty soy sauce based broth, since in Japan, it is appropriate and common to finish off drinking the broth straight from the bowl. The fried rice, which was rather plain, just goes along with ramen and gyoza. Although hot and definitely priced right, the rice was quite skimpy on pork and egg additives. 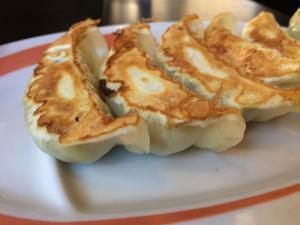 Grilled just right, the gyoza hit the spot once dipped in soy sauce, vinegar and the spicy rayu oil. Filled with white cabbage, garlic, ginger and Welsh onion, it tasted wonderful. We could not deny the 100-yen ice cream with fudge sauce. The low price was indicative of the taste, however. Upon completing our dessert, we noticed the anxious crowd awaiting the next possible table available. In brief, Kourakuen is an eatery with great value, served efficiently with acceptable food. Since the shop is very popular and always has a line, they don’t take reservations. The restaurant takes most IC cards, such as Pasmo, Suica and ID for your quick payment. An English menu is available upon request, as well. As a national chain with 554 restaurants (35 in Tokyo and 47 in Kanagawa Prefecture), you may be able to find one near your installation. Like most things in Japan, the cheap lunch is worth trying at least once.